Abu al-Walid Muhammad ibn Ahmad ibn Rushd, better known in the Latin West as Averroes, was one of the most important Muslim polymath and philosopher, who attempted to create harmony between faith and philosophy, between Aristotelian ideas and Islam, and in doing so, had a major impact on Western Intellectual tradition. This Spanish-Muslim influential commentaries and unique interpretations on Aristotle revived Western scholarly interest in ancient Greek philosophy, whose works for the most part had been neglected since the sixth century and it was in large part through the Latin translations of his work beginning in the 12th century that the legacy of Aristotle was recovered in the Latin West. He critically examined the alleged tension between philosophy and religion in the Decisive Treatise, and he challenged the anti-philosophical sentiments within the Sunni tradition sparked by al-Ghazzali. This critique ignited a similar re-examination within the Christian & Jewish tradition, influencing a line of scholars who would come to be identified as the “Averroists” such as Thomas Aquinas & Maimonides. The Tahafut al-Tahafut, written not long after 1180, is his major work and the one in which his original philosophical doctrine is to be found. 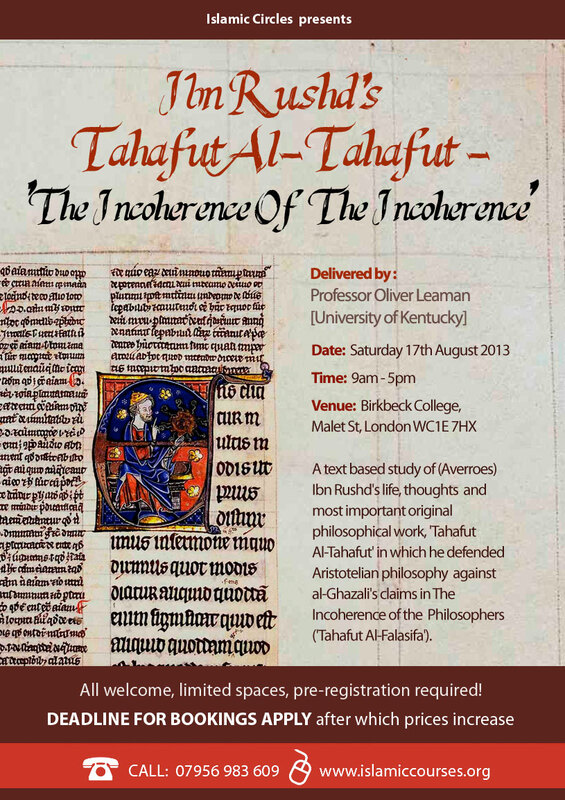 Written in the style of a dialogue, it takes the form of a refutation of Ghazali’s Tahafut al-Falasifa (The Incoherence of the Philosophers), a work begun in 1095 which attacked (Islamic Neoplatonic thought) philosophical speculation, such as the works of Ibn Sina (Avicenna) and declared some of the beliefs of the Philosophers to be contary to Islam. Ibn Rushd sets his Aristotelian views in contrast with the Neo-Platonist ones attributed to the philosophers by Ghazali. Ibn Rushd contended that the claim of many Muslim theologians that philosophers were outside the fold of Islam had no base in scripture. His novel exegesis of seminal Quranic verses made the case for three valid “paths” of arriving at religious truths, and that philosophy was one if not the best of them, therefore its study should not be prohibited. He also challenged Asharite, Mutazilite, Sufi, and “literalist” conceptions of God’s attributes and actions, noting the philosophical issues that arise out of their notions of occasionalism, divine speech, and explanations of the origin of the world. Ibn Rushd strived to demonstrate that without engaging religion critically and philosophically, deeper meanings of the tradition can be lost, ultimately leading to incorrect understandings of the divine. 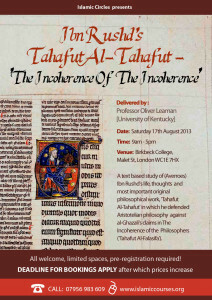 This one day course will be a text based study of (Averroes) Ibn Rushd’s life, thoughts and his most important original philosophical work, ‘Tahafut Al-Tahafut’ in which he defended Aristotelian philosophy against al-Ghazali’s claims in ‘The Incoherence of the Philosophers (‘Tahafut Al-Falasifa’)’.